Great ideas! I'm sure I'll be coming back here soon looking for a blog post idea! I just started blogging this month, so these ideas are definitely a big help especially if I ever hit a wall (which I hope I won't for a while) fingers crossed I believe!. Such a great inspiration! Thanks a lot for sharing your thoughts! There are some ideas that I like A LOT. Thank you for the wonderful list of ideas! This is very helpful. Cute blog! Gah I LOVE this post. I have really been struggling with what to post next to much in my mind to concentrate and this has helped. Thanks for the ideas, there are some I didn't even think of that are great! Dear Fleur! This was amaaaaaaazing :D We are always looking for topics to post about & if they are cheap at the same time - well all the better! So many good ideas, thank you for the inspiration. It's so easy to slip into bloggers block and little ideas like these that aren't to hard to do really help. These are great ideas, I will definitely be looking back at these in the future. I've just started up my blog and have actually used some of these ideas in my "start up" posts! I don't want my blog to be all about things I've brought because to be honest I really don't have the money to do that with the amount of times I want to write blogs! You have really given me some food for thought with ideas that won't cost a penny! I am very new to blogging and your blogs are really helping me, so for that I thank you! 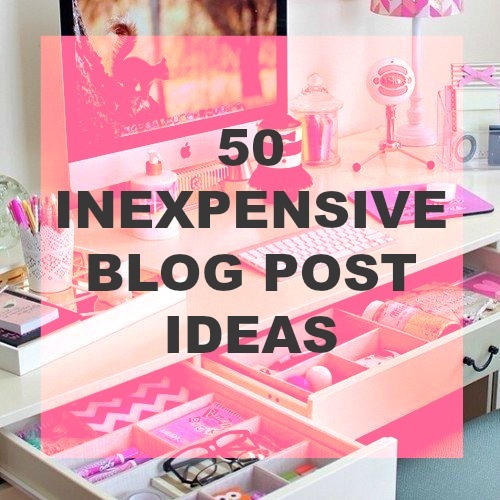 Thanks dear for sharing such a wonderful information full of 50 unique and inexpensive ideas of blogging. great ideas and a long list sometimes you just don't think of the simple things. thanks for all the ideas! I think I'll try #17 (and probably some others). it's always nice to find new ideas since my blog is fairly new. thanks so much! Oh I just love this post! So helpful for a new blogger like me ;) Thanks!! Some brilliant ideas here, thank you! This is a great post. I'm a newbie blogger and I needed this! Thanks for sharing!